A common theme throughout my blog is that since the 1940’s many areas of London have changed so dramatically that they are almost unrecognisable, however there are almost always some points that have remained fixed and remain to this day to allow a photo from over 60 years ago to be compared with today from very similar points of view. 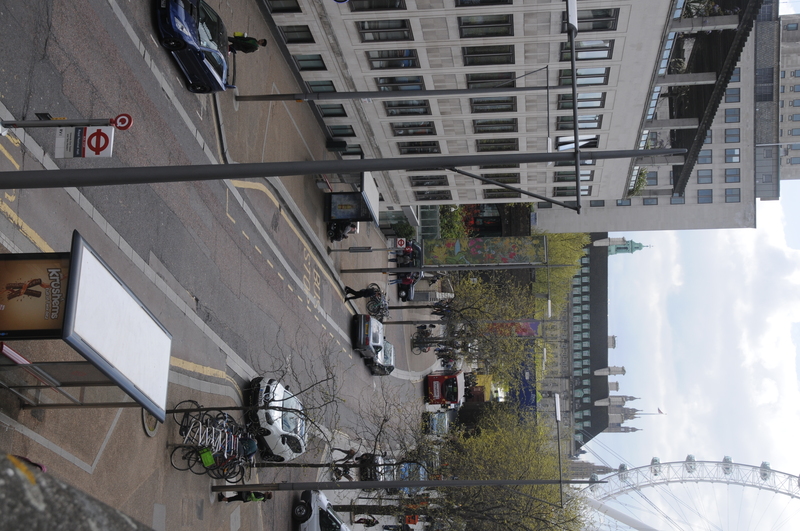 One of these areas is the South Bank, and for this post specifically the area bounded by Waterloo and Hungerford Bridges and Waterloo Station. In my father’s photo collection there are a series of photos covering the South Bank as it was starting just after the war and through to the Festival of Britain which was held on the site, with the Royal Festival Hall being the legacy from the Festival. Over the coming months I will cover this area in detail, however as a starter I have three photos that show the area as the demolition started in preparation for the building of the Royal Festival Hall. 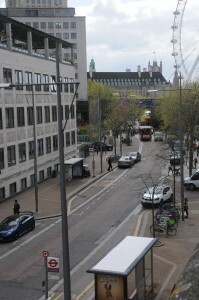 The first photo was taken from the area of Waterloo Bridge looking towards County Hall. The road in the centre of the photo is Belvedere Road and the bridge is taking the railway line from Hungerford Bridge across the Thames and Charing Cross station to Waterloo East. 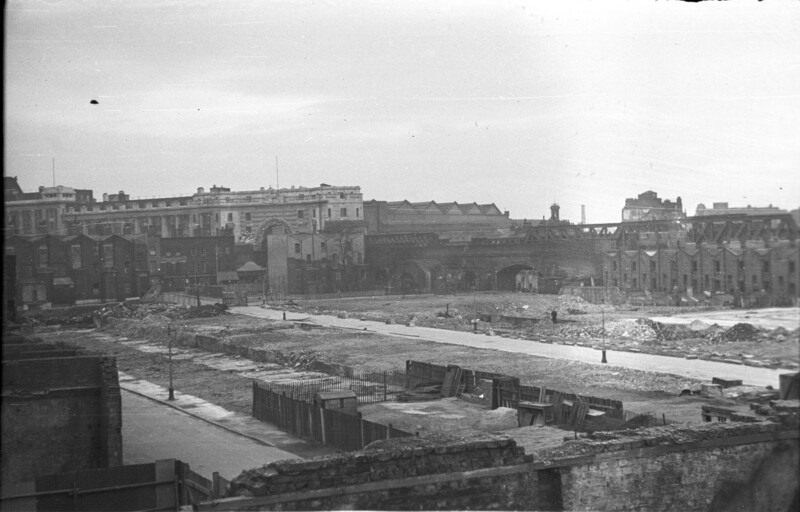 The area to the right was ready for demolition and the construction of the Royal Festival Hall. The white sign to the right of the road is for “North London Demolition” indicating that demolition had already or was about to start. The sign just to the right of the bridge is for “Southern Railways Sale Room”. Not sure what would have been sold here as it is some distance from the station, perhaps unclaimed lost property? Although it should have been easy, I had some challenges trying to find the location for this photo. Firstly it was not taken from ground level and as far as I can tell was not taken from Waterloo Bridge, but may have been taken from some derelict building adjacent to the bridge. Belvedere Road still runs in almost the same position and the bridge is still in the same location although obscured by trees. I moved to the left and took the photo on the right which shows the road and bridge. I suspect the original curve of the road has been smoothed out slightly during the construction of the Royal Festival Hall, however it is still in almost exactly the same place. As far as I can tell, the three photos I am featuring were taken from roughly the same position. 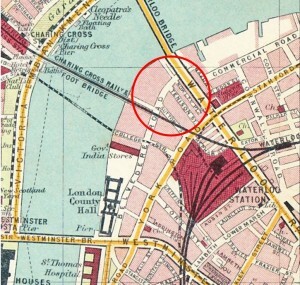 The main entrance to Waterloo Station just to left of centre of the photo is almost the same as it is today. The railway still runs across the same arches, however the arches are now mainly occupied by bars and restaurants. The map extract to the right is taken from the 1913 edition of Bartholomew’s Handy Reference of London & Suburbs. I have circled the area being covered in this post. The map identified the two roads shown in the above photo. The road in the centre of the photo was Tenison Street and the road to the left was Rowley Place. There are no obvious people in these photos, however look just to the right of centre in the above photo and there is a man standing on the site of the demolished buildings. Had he lived here and was returning to see what had been done to the area or just a curious passer-by? In the first photo there are a couple of children in the street with a cyclist just behind them. 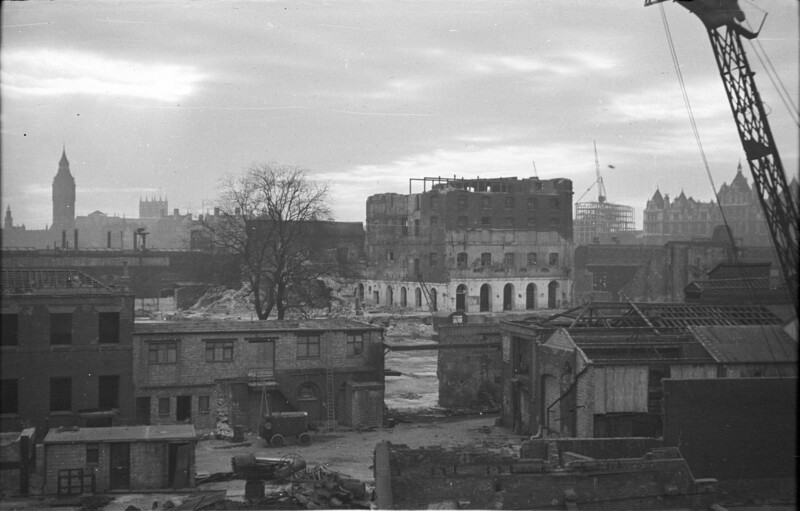 Despite the horror and destruction of the war and the bombing of London, the large number of derelict sites across London during and after the war effectively became an adventure playground for children. Reading through my father’s account of his childhood in London during the war he tells of exploring and playing across the old bomb sites. They were not fenced off, there were effectively no health and safety rules as there would be today and London was free for a child to explore. For this one it was very difficult to get the position right as the view of Waterloo Station is now totally obscured. I suspect that in the original photo Belvedere Road runs behind the brick walls. Waterloo Station is just behind the office blocks. All these were part of the original Shell Centre complex built for the Shell oil company between 1957 and 1962 after the closure of the Festival of Britain. The building to the left was the “Downstream Building” and the building and tower to the right was the “Upstream Building”. All part of the same complex connected by tunnels under the railway so that employees could move between buildings without going outside. The Downstream Building on the left was sold by Shell in the 1990’s and was converted into residential apartments. 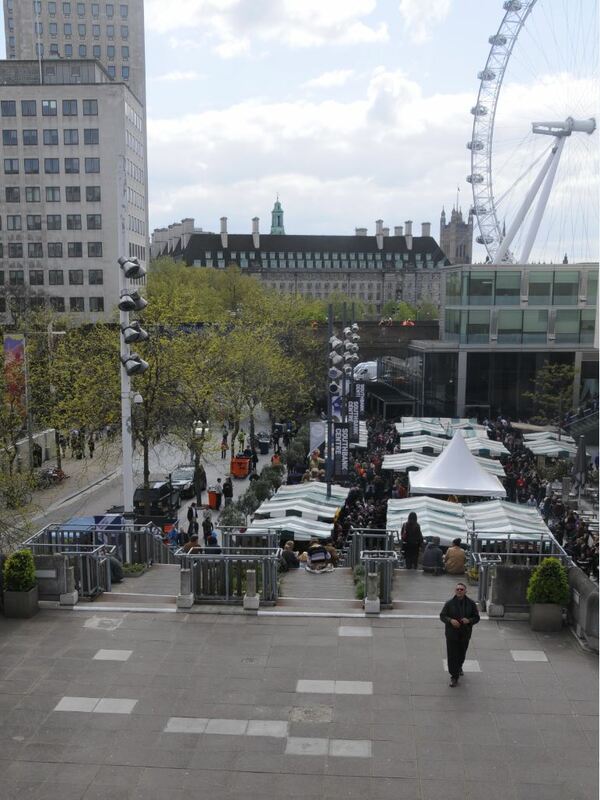 Now turning to the right we can look across the site that will be occupied by the Royal Festival Hall. 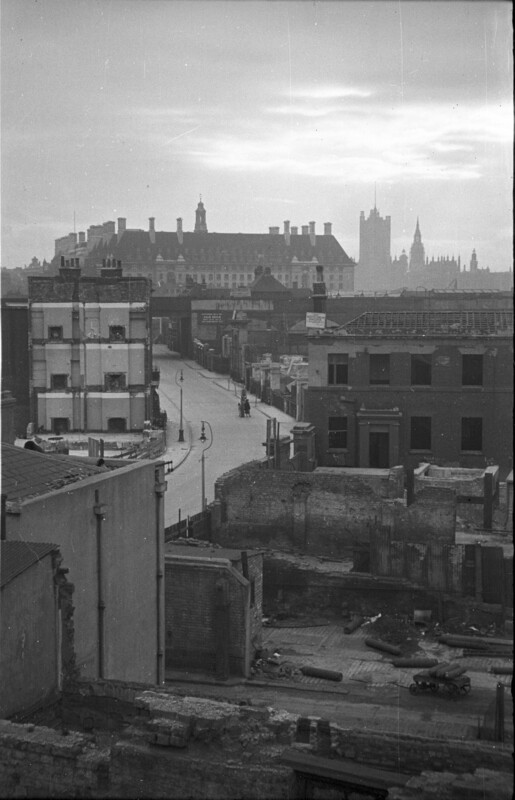 The large building is what is left of the Lion Brewery, the white Lion which used to stand on top of the building has already been removed and now stands at the southern end of Westminster Bridge. The building in the distance under construction with the cranes is the Ministry of Defence building that still stands on the north bank of the Thames. 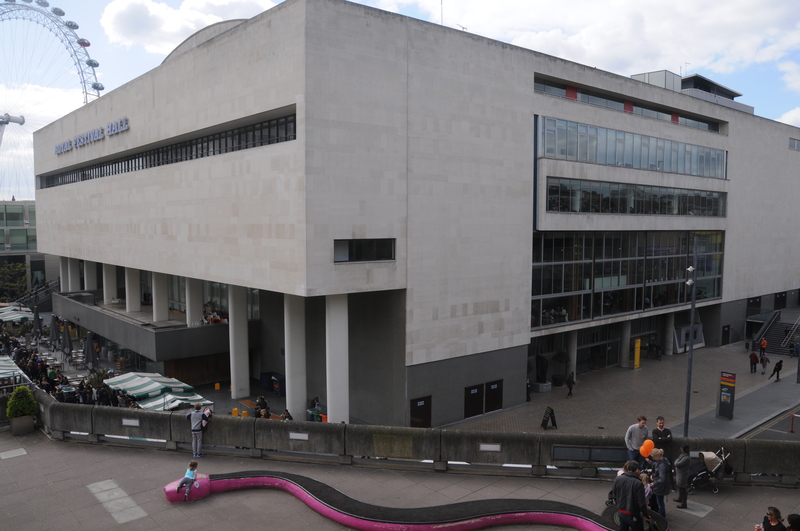 The South Bank is a fascinating place that sums up in a small area the changes that have and continue to take place across London, the change from light industrial use to service industries, entertainment and expensive apartments. Over the coming months I will continue to explore the South Bank with the development of the Festival of Britain and the Royal Festival Hall. This entry was posted in London Vistas on May 4, 2014 by admin. Enjoyable post. Such interesting photographs. David, I think these are the most extraordinary photographs so far. I had no idea of the extent of the bomb damage along the South Bank. In the first photo, I find the fireplaces suspended in mid-air on the left hand side of the photo particularly poignant. So much has changed! I am so intrigued by your blog, and by all the hard work and research that goes into it. My grandparents had a Public House called the Watermans Arms, 120-122 Belvedere Road, Waterloo. They had to move because the pub was going to be demolished because they wanted to build the Royal Festival Hall. I am looking for photos of the Pub. Hi Ann. 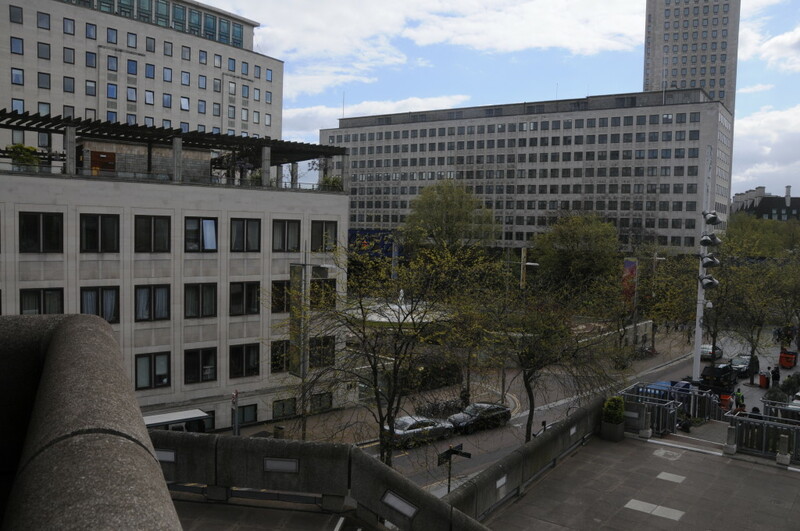 I have several photos of this area before demolition for the Royal Festival Hall. There is only one part view of a Pub and this is on the corner of Sutton Walk and Belvedere Road. Could it be this one? My Mother & Father plus us three children lived at 55 Belvedere Road until the whole was demolished for the Festival of Briton site. My Great Grandparents lived at 7 Prince’s Buildings from the very early 1900’s. My grandparents married in St Johns then lived at no 6 Leake Street until they were moved out in 1949 for demolition. My dad and his siblings were mostly born whilst living there, being delivered at either the Lyin in hospital or Lambeth hospital. The house was part of McGaw and Co Moulding Works, York Road. If you stand at the entrance to the Leake Street tunnel today and look up it still reads ‘McGaw and Co Moulding works on the building overlooking the railway. I would dearly like to find a photo of the house and indeed The Ordnance Arms that stood on the corner of Leake Street and York Road. I can’t believe that a pub stood on that busy street for at least 75 years and I cannot find a photo of it. From other documents I’ve read on the area I think the original pub came down between 59-62. The building that replaced it has now also been demolished. The Ordnance Arms was rebuilt a few doors along and I think it became the Jubilee Tavern. That too has now gone. McGaw and Co fronted onto York Road, between the Ordnance Arms and the General Lying In Hospital but I think their yard was accessed from Leake Street. Any info would be very much appreciated. I live in Ham, a London 60’s suburb that was once marsh land, and was then filled in with WW2 rubble. I learnt the other day, specifically rubble from the pre festival hall site. So amazing to see photos of what is now under my house! Thanks for the rare photos! My great grandad owned the Watermans Arms I would love to see more photos! I have most of the pictures that you have posted here, the picture of Sutton Walk and the front of the Old Lion Brewery, the house in the back round is the house my family lived in until 1949 and I was born in. My father worked for the London Waste Paper Co., and my grandfather worked in the Shot Tower stoking the boilers there until we moved. My Grand Parents moved to Munro House just off the Lower Marsh and the rest of our family moved to Tulse Hill. They used to drink in just about every pub in the area, it’s just a pity that so much time has passed since they were alive. My father had the same name as me, William (Bill) KNOX and my mother’s name was Alice Maud KNOX. Can you remember the little shop, next to, or adjacent to the Pub, I think it was called Dwyer’s, or something like that, it was a small general shop . The lion statue that adorned the top of the Lion Brewery is in fact the on now standing outside the Twickenham Rugby Stadium. The lion statue on Westminster Bridge which is smaller used to be situated above the entrance gates to the brewery.